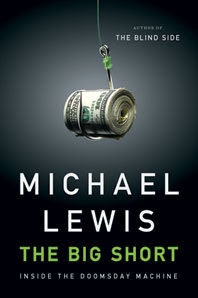 Don't read 'The Big Short: Inside the Doomsday Machine,' by Michael Lewis, if you're trying to keep your blood pressure down, because what this book makes clear about the economic meltdown of 2007-2008 is that it was triggered by Wall Street insiders. Bankers, bond traders, stockbrokers, hedge-fund managers either didn’t know what they were doing, or knew but didn’t care. In creating, selling, and buying credit default swaps, collateralized debt obligations, and other increasingly baroque financial instruments built on a foundation of shoddy subprime mortgages, Lewis writes, they were “either crooks or morons.” They made billions before losing trillions of dollars of other people’s money, and it would be nothing more than depressing and enraging if Lewis weren’t such a great reporter and storyteller, going behind the scenes of the financial crisis from the point of view of a handful of people who bet against this insane bubble. “It was incredible,” said Charlie [Ledley, a principal with Cornwall Capital, and one of Lewis’ protagonists]. “Stream of consciousness. He went on about how the ratings agencies were whores. How the securities were worthless. How they all knew it. He gave words to stuff we were just suspecting. It was like he was talking out of school. When he was finished there was complete silence. No one specifically attempted a defense. They just talked around him. It was like everyone pretended he hadn’t said it.” On the one hand, it was exhilarating to hear a market insider say what he thought to be true; on the other, if the market became self-aware, its madness couldn’t last long. So, meetings were a part of the madness — but they also helped bring it to an end.